Check out the full transcription on the Heinz Marketing Blog starting Monday January 21st. 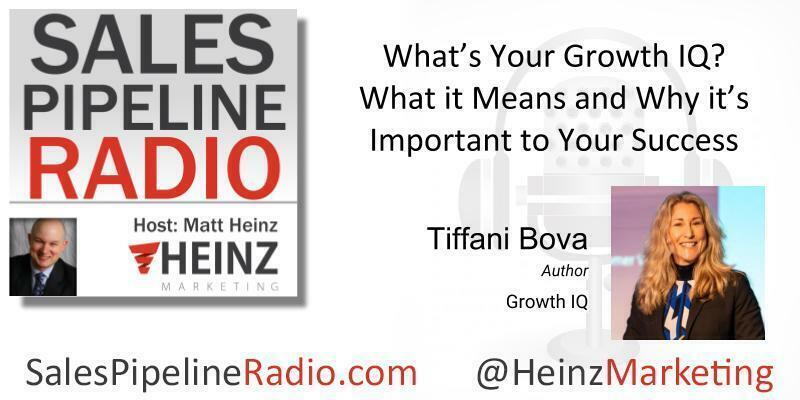 Tiffani is the author of the recently published book, Growth IQ: Get Smarter About the Choices that Will Make or Break Your Business. She discussed with Matt the reasons behind the book and why she wrote it. This is a Wall Street Journal Best Seller. She said that the number one thing CEOs and executives are focused on is growth. Bova found the Growth IQ is how we get smarter about the decisions we make. What she would consistently see and hear were, we're having softness in our sales numbers or we're finding it more difficult to grow than we have in the past, and it would tend to pull the same levers. There were patterns, Bovi said, that she was hearing in high performance organizations and it she found she could sort these into specific patterns and she outlined 10 in the book. She and Matt talked about what she learned about the combination and sequences of a growth pattern and the importance of implementation. Our advice? listen to Tiffani Bova’s Podcast. Buy the book.